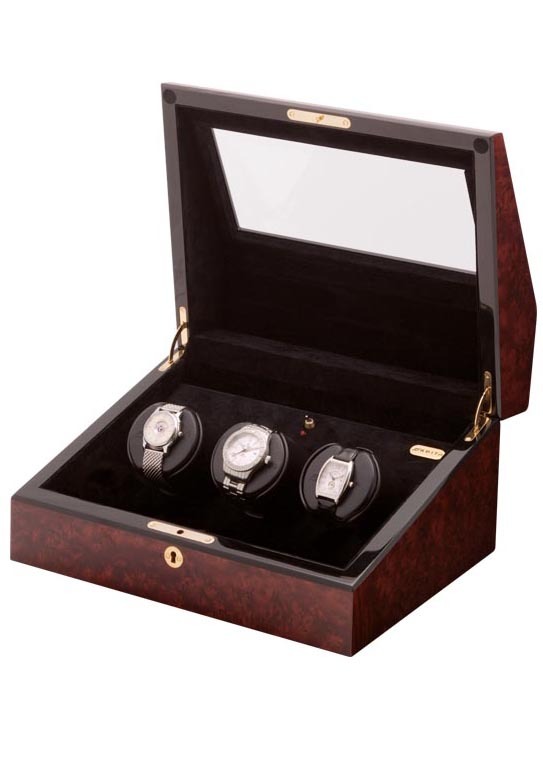 Burl case with a high-gloss durable lacquer finish and a suede lined interior it has a spacious area in front to accommodate strap watches and personal jewelry. This case is fitted with a beveled glass viewing panel. This triple winder has a sloped front case that houses an easily removable drive station fitted with three ironless core gear motors to provide independent operation for each of the three rotating cups. Each winder is a self programming winder module powered by 5-year Lithium batteries. The patented ROTORWIND® system "rocks" the watch in an oscillating mode, once every ten minutes, 24/7. This gentle action replenishes the mainspring tension lost in the previous 10 minutes, assuring virtually constant mainspring torque. That is the optimum arrangement to insure the highest watch accuracy. Ball bearing construction throughout, coupled with the use of Swiss designed ironless core precision servomotors assures long life with no maintenance ever required. A "low" battery light automatically signals when battery replacement is due.